Having seen how events like murders, suicides, accidents and various epidemics take place and are covered up immediately at Sathya Sai Baba’s ashrams, virtually disappearing from any kind of record of events, I refer to some events at Sathya Sai Baba birthday celebrations, as recorded in my diary notes through the years. 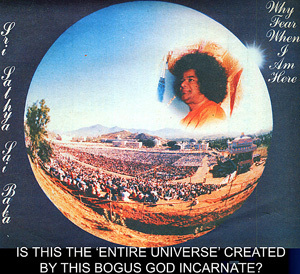 1) At the 60th Birthday celebrations of Sathya Sai Baba at Prashanthi in 1985 there was a virtual epidemic of stomach ailments, especially among Western visitors. This was denied officially, no doubt so as not to put anyone off visiting as a result. One Western doctor who was present estimated those foreigners affected could amount to 80%. Many people who had been there confirmed that many were affected. Also, the usual throat and chest infections due to excessive clouds of dust – up to at least 2-3 metres high during the main celebrations which obscured objects even at short distances! That there had been any kind of epidemic, however, was publicly denied as baseless rumour in Sanathana Sarathi. One contributing cause of the excessive infection rate was the new Western canteen, where the refuse was dumped outside it upon which masses of flies bred which easily entered the canteen, then without any netting on the windows. [This was confirmed by Al Drucker to foreigners who cleaned up the canteen afterwards – including myself]. 2) During the 65th Birthday celebrations in 1990, the dust clouds were reported by returning visitors to have been very bad and many throat and chest infections occurred. There were also very serious crowd crushing incidents due to vip cars which severely disrupted the routes of pedestrians. 3) During the 70th Birthday celebrations in 1995, a very large proportion of visitors suffered throat & chest infections, though probably fewer than during the previous two major birthdays, as the dust was not as thick and pervasive. I was present and contracted a severe throat infection and influenza like illness. Some half-dozen devotees, among them were crushed and lost consciousness at the entrance to the Hillview Stadium, where my wife and two friends were in severe danger of having the breath crushed out of them by the moving crowd, a very scary event. These problems were caused by the President of India’s Black Berets security forces and the bungling police under their orders. They closed the gates against the tide of a vast crowd and threatened the use of batons on the foremost of the devotees. This was not the first time the Black Berets and police showed such stupidity, all of whom who behaved as if ordinary people were cattle and of no account whatever. 4) The estimated numbers of persons during each of these celebrations was doubtless much in excess of the actual numbers. Figures of from 1 to 3 million have been suggested for the various birthdays!Sathya Sai Baba stated to several persons (Robert and Rita Bruce, V.K. Narasimhan and others) that 3 million were present, which was a total impossibility. V.K.N. told me several times that Sathya Sai Baba regularly multiplied numbers of actual visitors by 10! At that festival in 1995, it was estimated by the ashram’s engineer (Mr. Ashok) that, at any one time, not more than 50,000 persons could occupy the Hillview Stadium. The entire accommodation facilities of the ashram and Puttaparthi are less than that figure. Others, however, considered its capacity to be even up to a maximum 2 hundred thousand very closely-packed people. Even when tents and outside campers are accounted for, the figure of 500,000 persons is reckoned to be much greater than the entire ashram area would permit. However, Baba Himself announced to several Westerners in a brief interview (including Robert Bruce, who informed me of this)that there had been three million at the Birthday Celebrations! [For the 75’th and 80’th birthdays the capacity was expanded by building tiers of seating around the entire stadium and making much fuller use of the area available. Still, it could not accommodate more than 500,000 at the maximum]. This entry was posted on October 29, 2008 at 9:34 pm	and is filed under Gurus, Health and Medicine, Personality Cult, Puttaparthi, Sathya Sai Baba. Tagged: Hillview Stadium, Puttaparthi ashram, Ruler of the Universe, Sai Baba's birthdays. You can follow any responses to this entry through the RSS 2.0 feed. You can skip to the end and leave a response. Pinging is currently not allowed.